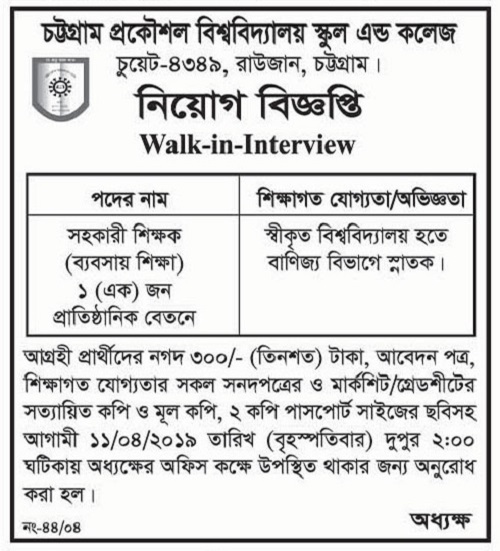 Chittagong University of Engineering and Technology (CUET) Job Circular 2019 has been published in daily newspaper by their authority and to get from the best jobs and education portal website by BD Jobs Careers – www.bdjobscareers.com . As a mention, the Chittagong University of Engineering & Technology commonly referred to as CUET, located in Chittagong, Bangladesh, is renowned as one of the public engineering universities in Bangladesh. The university maintains a special emphasis on research. It was founded in September 1, 2003. However, good news is, recently the public university looking various positions new manpower for their university empty vacancy. If you want to Government University jobs circular in Bangladesh, this is best one, for your help, we have already added this job full requirements such as job circular image, published date, application deadline etc. So, interested candidate check this Public University jobs news 2017 and if you think you are suitable and right candidate to your application by maintain applying procedure in right time. ■Job Position: Various Positions See Below Job Circular Image. ■Salary: According to government pay scale 2015. ■Experience Requirements: Please, To See Below Job Circular Image. ■Type of Jobs: Government University Jobs. ■Applying Process: To Follow Below Job Circular Image. In present Bangladesh, a government university job is a most popular and well liked profession for the people. There are lots of new gradate always trying to getting university lecturer jobs, this reason we have been providing all university jobs circular news such as, national university jobs in Bangladesh, public university jobs in Bangladesh, private university job circular 2019, Primeasia university job circular, southeast university job circular, green university job circular 2019, university teaching jobs in Bangladesh, college and university jobs in Bangladesh, private university lecturer jobs in Bangladesh, university teaching jobs in Bangladesh, lecturer jobs in Dhaka, Bangladesh university job circular, jobs in north south university Bangladesh, jobs in northern university Bangladesh, private university jobs in Bangladesh so on. Our main aim helps the job seekers specially who are finding quality jobs also our wish to become a best jobs circular website in Bangladesh through the publishing jobs news. Just, Keep connected with us as well as like our Facebook Page and Join Facebook Group, Hope you will be benefited by getting latest jobs circular news. Thanks for your time being. This entry was posted in Chittagong Jobs, Epaper Jobs, Government Jobs, Observer Newspaper, Today Job by admin. Bookmark the permalink.